Lightly spoon flour into measuring cup; level off. In large bowl, combine 1 cup flour, 1/2 cup of the sugar, salt and yeast; blend well. Grease 2 large cookie sheets. In small bowl, combine nuts, remaining 1/2 cup sugar and cinnamon; blend well. Drop about 1/4 cup dough into nut mixture; thoroughly coat. 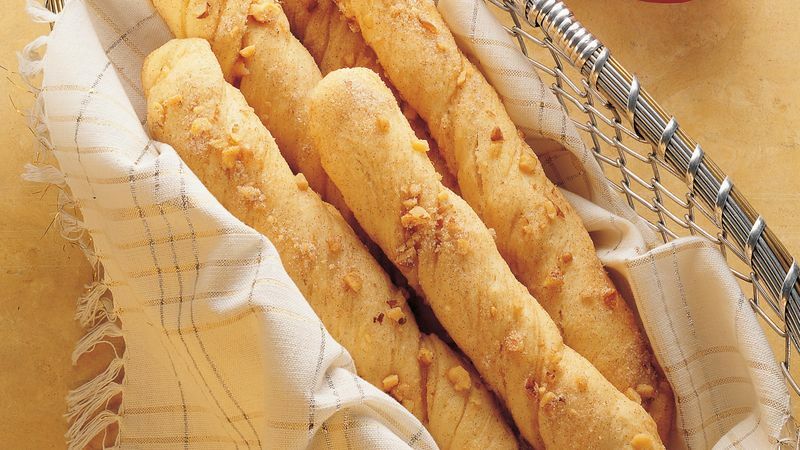 Stretch dough to about 8 inches in length; twist into desired shape. Place on greased cookie sheets. Repeat with remaining dough. Cover; let rise in warm place, about 15 minutes. Heat oven to 375°F. Uncover dough. Bake 8 to 16 minutes or until light golden brown. Immediately remove from cookie sheets; cool on wire racks. Serve warm.